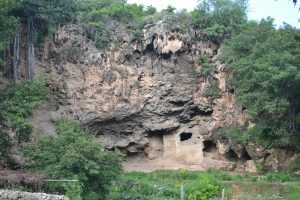 Shah Allah Ditta is a several centuries old village on the Khanpur end of Margalla hills, right after sector D-12. This ancient village lies on the old road that connected Punjab with Mansehra and old silk route further north. Local people called it Gernaili road (Sher Shah’s road) road that means it was likely there around 1486-1585. A watering hole was built for travelers at Shah Allah Ditta village by Akbar (1556-1605) which is still there. Some remnants of the old road are also visible. 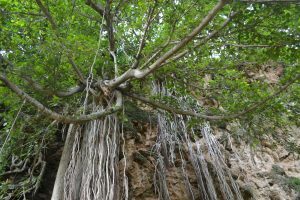 Then there is this huge Banyan tree, ancient caves, a clear water stream and legend of Buddhist markings (not anymore) which shows the track was around in the Buddhist time 1000 BC, as well. The banyan tree itself has to be several centuries old judging from its girth and its man-planted. There are other similar trees in the route leading up to the place as well. Just Google-mapping the route show that it was a good idea to go over Margalla hills to reach Taxila instead of circling around the tapered end of Margalla at Nicholson’s monument. Local legend says Alexander the great used this route when coming down from Chitral to whop Porus’s behind at Jehlum. As Potohar plateau is already known to be Buddhist country, therefore my theory seems plausible. Furthermore, Taxila, which is right across this Margalla divide, had a Buddhist university in ancient times, called the Takshashila. The Brahman philosopher and strategist Chanakiya (aka Kautilya 324 BC) lectured Chandar Gupt Mauriya at Taxila. This is a very picturesque cycling track that leads straight into the clearer side of Khanpur Dam, through valleys. 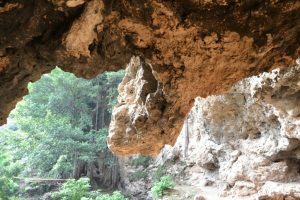 On the foothills of Margalla are the old caves which were used by Shah Allah Ditta, the hermit and then by a Hindu by the name of Sadhu. This Sadhu vanished around the 60s. Hindu religion has a thing for caves in remote areas like the one in the middle of nowhere in Hingol, Baluchistan called the Hanglakh Mandir. The lush green Saffron fields beyond the first layer of Margalla hills are absolutely stunning— because nobody goes there. The best part of this tour is having a hot cup of tea at the top of Margalla hills overlooking the city early in the morning and watching the sunrise. The other side gets bumpy and the ride is tricky downwards.